The Louisiana Purchase encompassed 530,000,000 acres of territory in North America that the United States purchased from France in 1803 for $15 million. As the United States spread across the Appalachians, the Mississippi River became an increasingly important conduit for the produce of America’s West (which at that time referred to the land between the Appalachians and the Mississippi). Since 1762, Spain had owned the territory of Louisiana, which included 828,000 square miles. The territory made up all or part of fifteen modern U.S. states between the Mississippi River and the Rocky Mountains. The Pinckney treaty of 1795 had resolved friction between Spain and the United States over the right to navigate the Mississippi and the right for Americans to transfer their goods to ocean-going vessels at New Orleans. 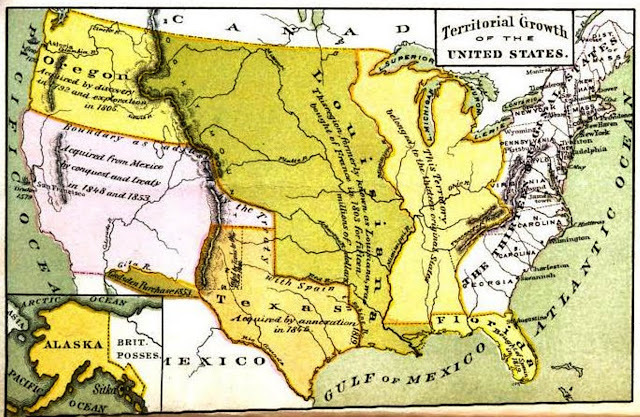 With the Pinckney treaty in place and the weak Spanish empire in control of Louisiana, American statesmen felt comfortable that the United States’ westward expansion would not be restricted in the future. In addition to making military preparations for a conflict in the Mississippi Valley, Jefferson sent James Monroe to join Robert Livingston in France to try to purchase New Orleans and West Florida for as much as $10 million. Failing that, they were to attempt to create a military alliance with England. Meanwhile, the French Army in St. Domingue was being decimated by yellow fever, and war between France and England still threatened. Napoleon decided to give up his plans for Louisiana, and offered a surprised Monroe and Livingston the entire territory of Louisiana for $15 million. Although this far exceeded their instructions from President Jefferson, they agreed. When news of the sale reached the United States, the West was elated. President Jefferson, however, was in a quandary. He had always advocated strict adherence to the letter of the Constitution, yet there was no provision empowering him to purchase territory. Given the public support for the purchase and the obvious value of Louisiana to the future growth of the United States, however, Jefferson decided to ignore the legalistic interpretation of the Constitution and forgo the passage of a Constitutional amendment to validate the purchase. This decision contributed to the principle of implied powers of the federal government. 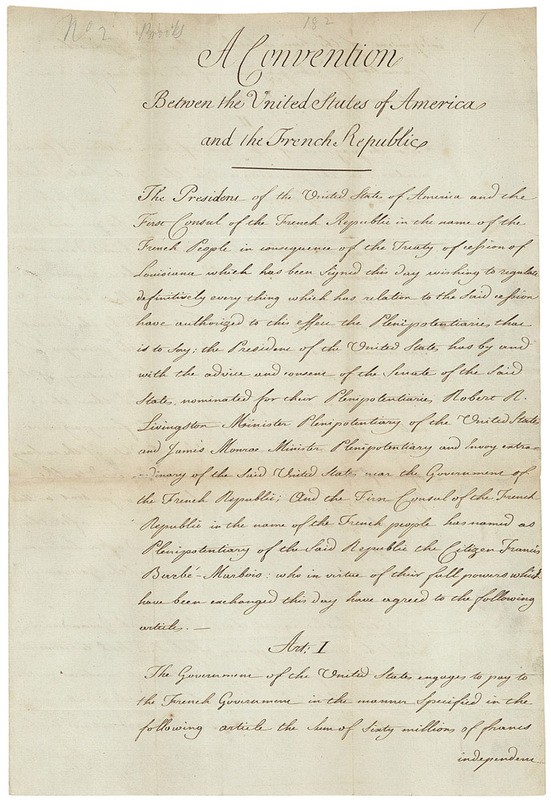 The President of the United States of America and the First Consul of the French Republic in the name of the French People desiring to remove all Source of misunderstanding relative to objects of discussion mentioned in the Second and fifth articles o f the Convention of the 8th Vendé miaire an 9/30 September 1800 relative to the rights claimed by the United States in virtue of the Treaty concluded at Madrid the 27 of October 1795, between His Catholic Majesty & the Said United States, & willing to Strengthen the union and friendship which at the time of the Said Convention was happily reestablished between the two nations have respectively named their Plenipotentiaries to wit The President of the United States, by and with the advice and consent o f the Senate of the Said States; Robert R. Livingston Minister Plenipotentiary of the United States and James Monroe Minister Plenipotentiary and Envoy extraordinary of the Said States near the Government of the French Republic; And the First Consul in the name of the French people, Citizen Francis Barbé Marbois Minister of the public treasury who after having respectively exchanged their full powers have agreed to the following Articles. And whereas in pursuance of the Treaty and particularly of the third article the French Republic has an incontestable title to the domain and to the possession of the said Territory--The First Consul of the French Republic desiring to give to the United States a strong proof of his friendship doth hereby cede to the United States in the name of the French Republic for ever and in full Sovereignty the said territory with all its rights and appurtenances as fully and in the Same manner as they have been acquired by the French Republic in virtue of the above mentioned Treaty concluded with his Catholic Majesty. Article II: In the cession made by the preceding article are included the adjacent Islands belonging to Louisiana all public lots and Squares, vacant lands and all public buildings, fortifications, barracks and other edifices which are not private property.--The Archives, papers & documents relative to the domain and Sovereignty of Louisiana and its dependences will be left in the possession of the Commissaries of the United States, and copies will be afterwards given in due form to the Magistrates and Municipal officers of such of the said papers and documents as may be necessary to them. Article III: The inhabitants of the ceded territory shall be incorporated in the Union of the United States and admitted as soon as possible according to the principles of the federal Constitution to the enjoyment of all these rights, advantages and immunities of citizens of the United States, and in the mean time they shall be maintained and protected in the free enjoyment of their liberty, property and the Religion which they profess. 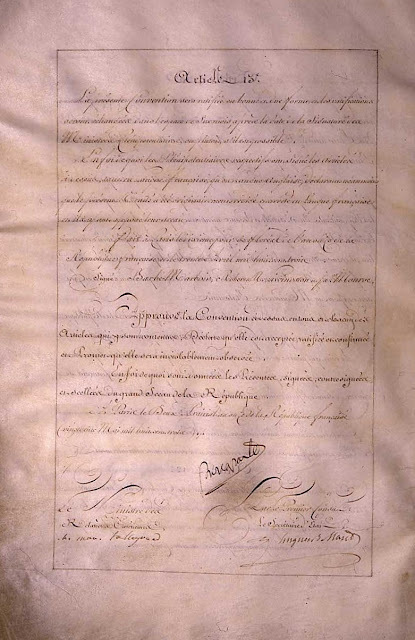 Article IV: There Shall be Sent by the Government of France a Commissary to Louisiana to the end that he do every act necessary as well to receive from the Officers of his Catholic Majesty the Said country and its dependences in the name of the French Republic if it has not been already done as to transmit it in the name of the French Republic to the Commissary or agent of the United States. Article V: Immediately after the ratification of the present Treaty by the President of the United States and in case that of the first Consul's shall have been previously obtained, the commissary of the French Republic shall remit all military posts of New Orleans and other parts of the ceded territory to the Commissary or Commissaries named by the President to take possession--the troops whether of France or Spain who may be there shall cease to occupy any military post from the time of taking possession and shall be embarked as soon as possible in the course of three months after the ratification of this treaty. Article VI: The United States promise to execute Such treaties and articles as may have been agreed between Spain and the tribes and nations of Indians until by mutual consent of the United States and the said tribes or nations other Suitable articles Shall have been agreed upon. 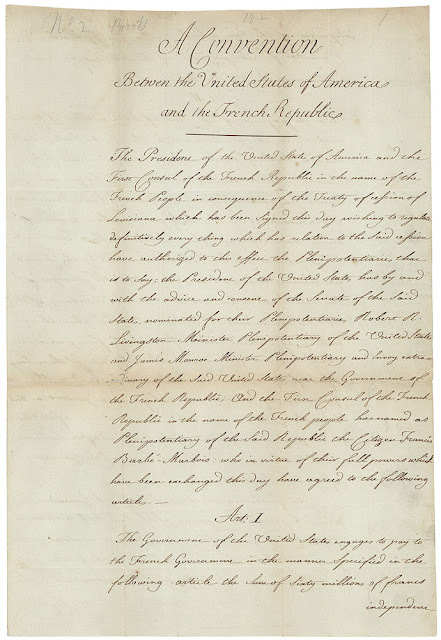 Article VII: As it is reciprocally advantageous to the commerce of France and the United States to encourage the communication of both nations for a limited time in the country ceded by the present treaty until general arrangements relative to commerce of both nations may be agreed on; it has been agreed between the contracting parties that the French Ships coming directly from France or any of her colonies loaded only with the produce and manufactures of France or her Said Colonies; and the Ships of Spain coming directly from Spain or any of her colonies loaded only with the produce or manufactures of Spain or her Colonies shall be admitted during the Space of twelve years in the Port of New-Orleans and in all other legal ports-of-entry within the ceded territory in the Same manner as the Ships of the United States coming directly from France or Spain or any of their Colonies without being Subject to any other or greater duty on merchandize or other or greater tonnage than that paid by the citizens of the United. States. Article VIII: In future and forever after the expiration of the twelve years, the Ships of France shall be treated upon the footing of the most favoured nations in the ports above mentioned. Article IX: The particular Convention Signed this day by the respective Ministers, having for its object to provide for the payment of debts due to the Citizens of the United States by the French Republic prior to the 30th Sept. 1800 (8th Vendé miaire an 9) is approved and to have its execution in the Same manner as if it had been inserted in this present treaty, and it Shall be ratified in the same form and in the Same time So that the one Shall not be ratified distinct from the other. Article X: The present treaty Shall be ratified in good and due form and the ratifications Shall be exchanged in the Space of Six months after the date of the Signature by the Ministers Plenipotentiary or Sooner if possible. Article 1: The Government of the United States engages to pay to the French government in the manner Specified in the following article the sum of Sixty millions of francs independent of the Sum which Shall be fixed by another Convention for the payment of the debts due by France to citizens of the United States. Article 2: For the payment of the Sum of Sixty millions of francs mentioned in the preceding article the United States shall create a Stock of eleven millions, two hundred and fifty thousand Dollars bearing an interest of Six per cent: per annum payable half y early in London Amsterdam or Paris amounting by the half year to three hundred and thirty Seven thousand five hundred Dollars, according to the proportions which Shall be determined by the French Government to be paid at either place: The principal of the Said Stock to be reimbursed at the treasury of the United States in annual payments of not less than three millions of Dollars each; of which the first payment Shall commence fifteen years after the date of the exchange of ratifications:--this Stock Shall be transferred to the government of France or to Such person or persons as Shall be authorized to receive it in three months at most after the exchange of ratifications of this treaty and after Louisiana Shall be taken possession of the name of the Government of the United States. It is further agreed that if the French Government Should be desirous of disposing of the Said Stock to receive the capital in Europe at Shorter terms that its measures for that purpose Shall be taken So as to favour in the greatest degree possible the credit of the United States, and to raise to the highest price the Said Stock. Art 3: It is agreed that the Dollar of the United States Specified in the present Convention shall be fixed at five francs 3333/100000 or five livres eight Sous tournois. The present Convention Shall be ratified in good and due form, and the ratifications Shall be exchanged the Space of Six months to date from this day or Sooner it possible. 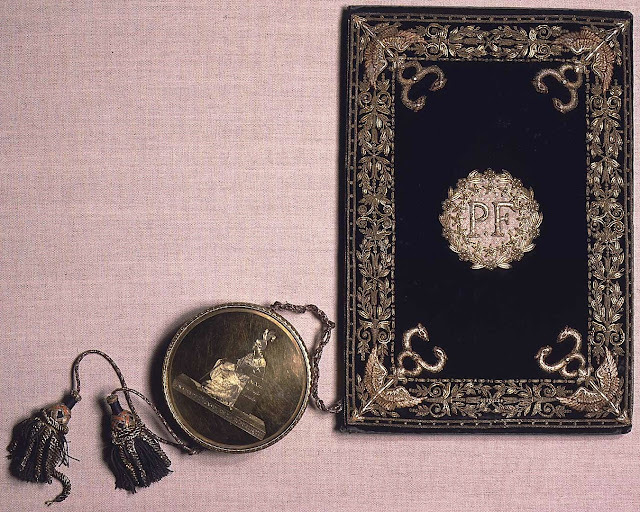 In faith of which the respective Plenipotentiaries have Signed the above articles both in the french and English languages, declaring nevertheless that the present treaty has been originally agreed on and written in the French language; to which they have hereunto affixed their Seals. The President of the United States of America and the First Consul of the French Republic in the name of the French People having by a Treaty of this date terminated all difficulties relative to Louisiana, and established on a Solid foundation the friendship which unites the two nations and being desirous in compliance with the Second and fifth Articles of the Convention of the 8th Vendé miaire ninth year of the French Republic (30th September 1800) to Secure the payment of the Sums due by France to the citizens of the United States have respectively nominated as Plenipotentiaries that is to Say The President of the United States of America by and with the advise and consent of their Senate Robert R. Livingston Minister Plenipotentiary and James Monroe Minister Plenipotentiary and Envoy Extraordinary of the Said States near the Government of the French Republic: and the First Consul in the name of the French People the Citizen Francis Barbé Marbois Minister of the public treasury; who after having exchanged their full powers have agreed to the following articles. Article 1: The debts due by France to citizens of the United States contracted before the 8th Vendé miaire ninth year of the French Republic/30th September 1800/ Shall be paid according to the following regulations with interest at Six per Cent; to commence from the period when the accounts and vouchers were presented to the French Government. Article 2: The debts provided for by the preceding Article are those whose result is comprised in the conjectural note annexed to the present Convention and which, with the interest cannot exceed the Sum of twenty millions of Francs. The claims comprised in the Said note which fall within the exceptions of the following articles, Shall not be admitted to the benefit of this provision. Article 3: The principal and interests of the Said debts Shall be discharged by the United States, by orders drawn by their Minister Plenipotentiary on their treasury, these orders Shall be payable Sixty days after the exchange of ratifications of the Treaty and the Conventions Signed this day, and after possession Shall be given of Louisiana by the Commissaries of France to those of the United States. Article 5: The preceding Articles Shall apply only, First: to captures of which the council of prizes Shall have ordered restitution, it being well understood that the claimant cannot have recourse to the United States otherwise than he might have had to the Government of the French republic, and only in case of insufficiency of the captors--2d the debts mentioned in the Said fifth Article of the Convention contracted before the 8th Vendé miaire an 9/30th September 1800 the payment of which has been heretof are claimed of the actual Government of France and for which the creditors have a right to the protection of the United States;-- the Said 5th Article does not comprehend prizes whose condemnation has been or Shall be confirmed: it is the express intention of the contracting parties not to extend the benefit of the present Convention to reclamations of American citizens who Shall have established houses of Commerce in France, England or other countries than the United States in partnership with foreigner s, and who by that reason and the nature of their commerce ought to be regarded as domiciliated in the places where Such house exist.--All agreements and bargains concerning merchandize, which Shall not be the property of American citizens, are equally excepted from the benefit of the said Conventions, Saving however to Such persons their claims in like manner as if this Treaty had not been made. Article 6: And that the different questions which may arise under the preceding article may be fairly investigated, the Ministers Plenipotentiary of the United States Shall name three persons, who Shall act from the present and provisionally, and who shall have full power to examine, without removing the documents, all the accounts of the different claims already liquidated by the Bureaus established for this purpose by the French Republic, and to ascertain whether they belong to the classes designated by the present Convention and the principles established in it or if they are not in one of its exceptions and on their Certificate, declaring that the debt is due to an American Citizen or his representative and that it existed before the 8th Vendé miaire 9th year/30 September 1800 the debtor shall be entitled to an order on the Treasury of the United States in the manner prescribed by the 3d Article. Article 7: The Same agents Shall likewise have power, without removing the documents, to examine the claims which are prepared for verification, and to certify those which ought to be admitted by uniting the necessary qualifications, and not being comprised in t he exceptions contained in the present Convention. Article 8: The Same agents Shall likewise examine the claims which are not prepared for liquidation, and certify in writing those which in their judgment ought to be admitted to liquidation. Article 9: In proportion as the debts mentioned in these articles Shall be admitted they Shall be discharged with interest at Six per Cent: by the Treasury of the United States. Article 10: And that no debt shall not have the qualifications above mentioned and that no unjust or exorbitant demand may be admitted, the Commercial agent of the United States at Paris or such other agent as the Minister Plenipotentiary or the United States Shall think proper to nominate shall assist at the operations of the Bureaus and cooperate in the examinations of the claims; and if this agent Shall be of the opinion that any debt is not completely proved, or if he shall judge that it is not comprised in t he principles of the fifth article above mentioned, and if notwithstanding his opinion the Bureaus established by the French Government should think that it ought to be liquidated, he shall transmit his observations to the board established by the United States, who, without removing documents, shall make a complete examination of the debt and vouchers which Support it, and report the result to the Minister of the United States.--The Minister of the United States Shall transmit his observations in all Such cases to the Minister of the treasury of the French Republic, on whose report the French Government Shall decide definitively in every case. The rejection of any claim Shall have no other effect than to exempt the United States from the payment of it, the French Government reserving to itself, the right to decide definitively on Such claim So far as it concerns itself. Article 11: Every necessary decision Shall be made in the course of a year to commence from the exchange of ratifications, and no reclamation Shall be admitted afterwards. Article 12: In case of claims for debts contracted by the Government of France with citizens of the United States Since the 8th Vendé miaire 9th year/30 September 1800 not being comprised in this Convention may be pursued, and the payment demanded in the Same manner as if it had not been made. Article 13: The present convention Shall be ratified in good and due form and the ratifications Shall be exchanged in Six months from the date of the Signature of the Ministers Plenipotentiary, or Sooner if possible. In faith of which, the respective Ministers Plenipotentiary have signed the above Articles both in the French and English languages, declaring nevertheless that the present treaty has been originally agreed on and written in the French language, to which they have hereunto affixed their Seals. Done at Paris, the tenth of Floreal, eleventh year of the French Republic. JOURNAL OF THE SENATE OF THE UNITED STATES OF AMERICA; BEING THE FIRST SESSION OF THE EIGHTH CONGRESS, BEGUN AND HELD AT THE CITY OF WASHINGTON, OCTOBER 17, 1803. The bill to enable the President of the United States to take possession of the territories ceded by France to the United States, by the treaty concluded at Paris, on the 30th of April, last, and for other purposes, was read the third time. And, on the question, Shall this bill pass? It was determined in the affirmative, Yeas ... 26, Nays ... 6. Did the Louisiana Purchase Extend to the Pacific Ocean? The Ninth Census Report of the United States, being for the year 1870, contains a map which represents the Province of Louisiana, commonly known as the Louisiana Purchase, acquired from France in 1803, as stretching from the Mississippi river to the Pacific Ocean. Up to the appearance of that report it was generally understood and believed that the territory in question extended no farther west than the Rocky Mountains. Every author of note, so far as is within the writer's knowledge, who has expressed any opinion on the subject, has so declared; but since the advent of the report, several compilers of school histories, adopting the verdict of the map and thus without making any investigations for themselves, have asserted in their books that the Purchase extended to the Pacific. One compiler, while adhering to his former statement, that " What is now the State of Louisiana was but a little part of the vast territory which then bore that name, for this territory extended from the Mississippi to the Rocky Mountains," has inserted in his book an exact copy of the census map referred to, without correcting any of its errors, one, of which includes Texas as a part of the cession made to the United States in 1848. Need he be told that Texas was annexed to the United States in 1845, and was immediately after represented in our Congress at Washington? There are other important errors in that map, notably one in respect to the original territorial limits of Kentucky. * It is thus seen that while some instructors are teaching that the western limits of the Louisiana Purchase did not extend beyond the Rocky Mountains, others hold that they did not stop short of the Pacific coast. Whom are we to believe? As both sides cannot be correct, and the subject is one of acknowledged importance, we will make a brief investigation into the facts. In the year 1682, the French explorer La Salle descended the Mississippi river to its mouth, taking formal possession of the country in the name of his king, Louis XIV. The Spaniards, under De Soto, had previously discovered the Mississippi and wandered over a large part of its valley, but neither De Soto's party nor any of his countrymen ever followed up the advantage thus gained by making a settlement within the territory, and consequently, according to the law of nations, Spain failed to reap the fruits of De Soto's success. The French were more active. In this great valley of the Mississippi they planted settlements and established missionary stations and military posts, and thus became the rightful owners of the entire region. If Spain at that time could lay any claim whatever to the region, that claim was surrendered to France in due time, as we shall see. Already we come to the important question upon which hinges the solution of the whole matter. What was the extent of the territory not merely occupied but claimed by the French? Parkman, in his "Discovery of the Great West," a work evincing extensive and patient research, says (p. 284): "The Louisiana of to-day is but a single State of the American Republic. The Louisiana of La Salle stretched from the Alleghenies to the Rocky Mountains, from the Rio Grande and the Gulf to the farthest springs of the Missouri." Greenhow, in his "History of Oregon and California" (p. 283), makes a like declaration, and so do all the other writers who have given special investigation to the subject. The French remained in possession of Louisiana till 1762. In November of that year, preliminaries of peace were agreed to at Paris, between France and Spain on the one side, and England and Portugal on the other, and, by the treaties directly afterward made, France ceded to Spain "all the country known under the name of Louisiana, as also New Orleans and the island on which that city is situated," and Great Britain, a little more than two months later, "received possession of Canada, Florida, and the portion of Louisiana east of the line drawn along the middle of the Iberville river to the sea." Spain thus came in quiet possession of all the region of Louisiana west of the Mississippi and the Iberville. (The Iberville is an eastern outlet of the Mississippi, about fourteen miles south of Baton Rouge.) The fact that arrests our attention at this stage of the investigation is that while the treaties made at Paris gave Louisiana a definite boundary on the east, nothing was said of a western boundary. Why was this omission? Greenhow (p. 279) offers a partial explanation in these words: "With regard to the western limits of Louisiana, no settlement of boundaries was necessary, as the territory thus acquired by Spain would join other territory of which she also claimed possession." The western part of Louisiana, it will be noted, joined other territory: it did not extend to the Pacific. During the next thirty-eight years Spain was in possession of Louisiana. In the year 1800, an exchange of territories was effected, Spain, in order to enlarge the dominions of one of her royal princes, transferring to France the Province of Louisiana in exchange for certain lands in Italy. The language of the transfer is an important factor in this investigation. "His Catholic majesty," so says the transfer, " engages to retrocede to the French Republic, the Province of Louisiana, with the same extent which it now has in the hands of Spain, and which it had when France possessed it, and such as it should be, according to the treaties subsequently made between Spain and other states." Was language ever more explicit? This does not look like giving to Louisiana the Pacific ocean for its western boundary. "Certainly," as has been aptly remarked, "no treaties entered into by Spain could enlarge the extent of Louisiana. Certainly Spain never relinquished more than she received." We now come to the acquisition of the Louisiana territory by the United States. This was accomplished, we all know, during Jefferson's administration. It is a matter of history that Jefferson had no thought of securing for the United States more territory than enough to give us the free navigation of the Mississippi river. In his letter of Feb. 1, 1S03, to Mr. Dupont, he says: "The country which we wish to purchase is a barren sand, six hundred miles from east to west, and from thirty to forty and fifty miles from north to south." Such being the case, Napoleon's proposition to sell the whole Province of Louisiana produced, as may well be supposed, a great surprise to the American negotiators in Paris, for they had only made efforts to procure a "cession of New Orleans and the Floridas." 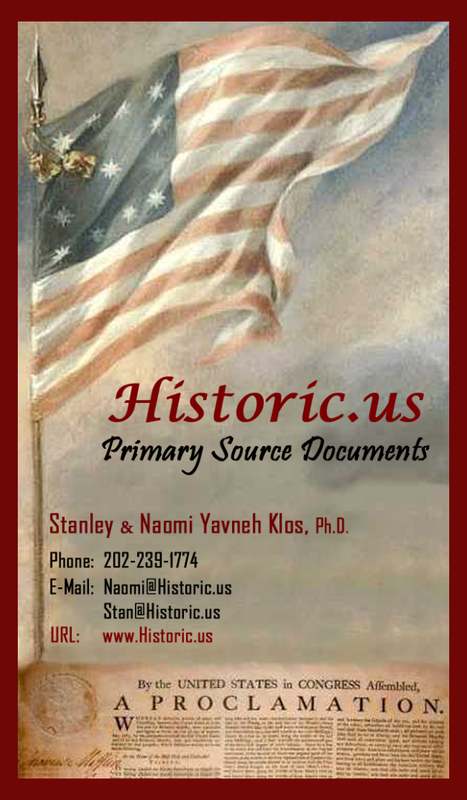 Transcending their authority, they accepted the offer, and the purchase was effected on the 30th of April, 1803. Now, the vital question just here is, What did we buy? How large was the purchase? The treaty, or, as we may call it, the bill of sale, itself, will best answer the question. After reciting the third article of the treaty of 1800, the territory thus retroceded to France was, says the bill of sale, "ceded to the United States, in the name of the French Republic, as fully and in the same manner as it had been acquired by the French Republic, in virtue of the above-mentioned treaty with his Catholic majesty." This, and nothing more. "No other description of boundaries," says Greenhow, "could ever be obtained from the French government." It was distinctly asserted by Marbois, the negotiator of the treaty on the part of Napoleon, that the French never owned any part of North America west of the Rocky Mountains. It is plain that " France could not sell to the United States in 1803 more than she recovered from Spain in 1800." In our negotiations with Spain, commenced at Madrid in 1804, for the adjustment of the lines which were to separate the territories of the two governments, Spain contended "that the Louisiana ceded to Spain by France in 1762, and retroceded to France in 1800, and transferred by the latter power to the United States in 1803, could not, in justice, be considered as comprising more than New Orleans, with the tract in its vicinity east of the Mississippi, and the country immediately bordering on the west bank of that river" (Greenhow, p. 280); and in 1818, up to the close of the long-pending negotiations, now conducted at Washington, Don Onis, the Spanish minister, firmly reiterated this declaration (Hildreth, vol. VI., p. 647). 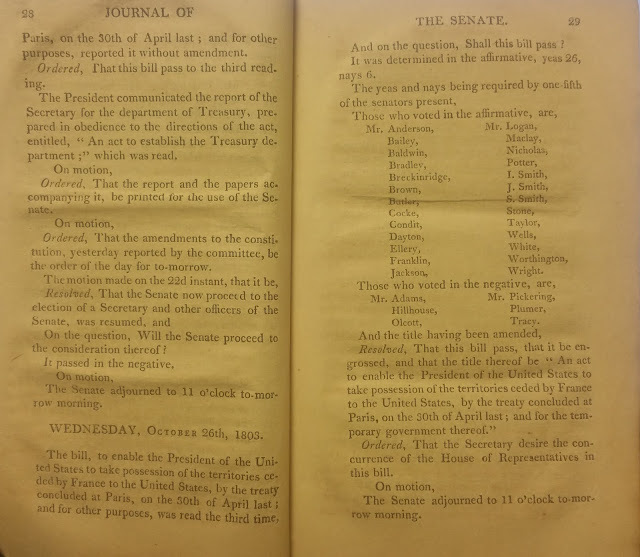 On the 12th of March, 1844, Mr. A. V. Brown, from the "Committee on the Territories," made a report in Congress, covering twenty-four closely-printed pages, in which this whole question is thoroughly discussed. In all this long report there is not the first attempt to prove that our right to Oregon cam,e to us through the Louisiana Purchase. 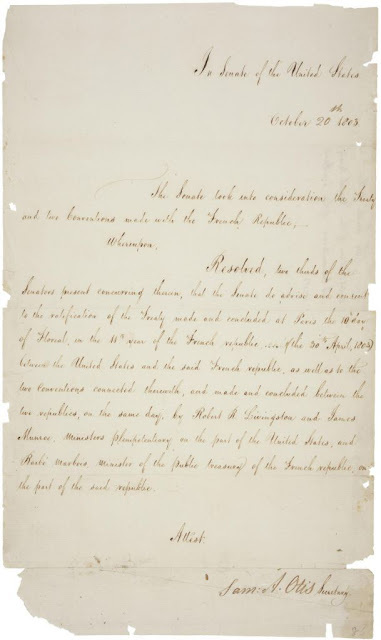 Witness the language of the report: "The Louisiana treaty cedes to the United States the Province of Louisiana, with the same extent it had in the hands of Spain in 1800, and that it had when previously possessed by France. This description is loose, but Napoleon chose to execute a quit-claim rather than a warranty of boundaries." But why did Napoleon so choose? Why did he not give us a deed of the territory to the Pacific? For the best of all reasons. He did not own, nor had he ever owned, that extent of territory. He sold us just what he had—nothing more. He wanted the money, for just at that moment he was going to war with England; and we, when the unexpected opportunity came, discovered that we wanted the land he could sell—every inch of it. The western boundary of Louisiana is, rightfully, the Rio Bravo, from its mouth to its source, and thence along the highlands and mountains dividing the waters of the Mississippi from those of the Pacific. On the waters of the Pacific we can found no claim in right of Louisiana. "—Jefferson to John Melish, Map-publisher, of Philadelphia, Dec. 31, 1816. We are forced to regard the boundaries indicated by nature—namely, the highlands separating the waters of the Mississippi from those flowing into the Pacific or the California Gulf—as the true western boundaries of the Louisiana ceded by France to Spain in 1762, and retroceded to France in 1800, and transferred to the United States by France in 1803. "—Robert Greenhow. We find Louisiana supported on the west border, as if by a buttress, by the great chain of mountains that give source to the Missouri and Columbia rivers. "— William Darby. The shores of the western ocean were certainly not included in the cession" of Louisiana to the United States.—M. Marbois. The conclusion of the whole matter is that no part of the territory west of the Rocky Mountains came to us by reason of the Louisiana Purchase in 1803, in this conclusion all the best authorities—Spanish, French, and American— agreeing. It need not be added that the English took the same view of the subject. * The writer addressed a note to General F. A. Walker, Superintendent of the Census, asking him for the information that induced him in his report to include the Oregon region in the Louisiana Purchase. The general, in his reply, says: "My reason for embracing Oregon in the territory covered by the Louisiana Purchase, for the purposes of the map printed in connection with the reports of the Ninth Census, or, rather, for allowing the map which Col. Stocking had prepared, '.o go into the work without correction in this particular, was, that the United States government' s I recall the negotiations, had made claim to Oregon by virtue of the Louisiana Purchase." In other communication, addressed to a prominent western educator, respecting the western limits signed in the map to the Louisiana Purchase, the general goes further, saying: "I am free to confess that my individual views do not coincide therewith."